(Photo courtesy of The Church of Jesus Christ of Latter-day Saints) The world leader of The Church of Jesus Christ of Latter-day Saints, President Russell M. Nelson, encourages members in the Phoenix area to increase their faith practices in the home. 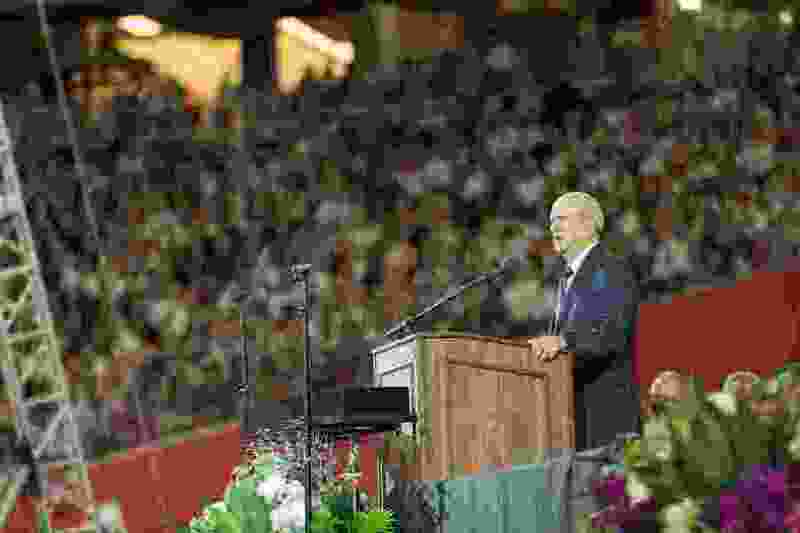 He and his first counselor, President Dallin H. Oaks, spoke to Latter-day Saints in State Farm Stadium Sunday, Feb. 10, 2019. Nelson — who addressed some 68,000 Latter-day Saints later Sunday at State Farm Stadium in Glendale, Ariz., the massive domed arena where the NFL’s Arizona Cardinals play — referred to a recent visit he and his wife, Wendy, made to Paradise, Calif., to meet with church members who endured the devastatingly deadly wildfires that tore through the northern reaches of the Golden State late last year. The trip came just two days after Nelson’s 67-year-old daughter, Wendy Nelson Maxfield, had died of cancer. 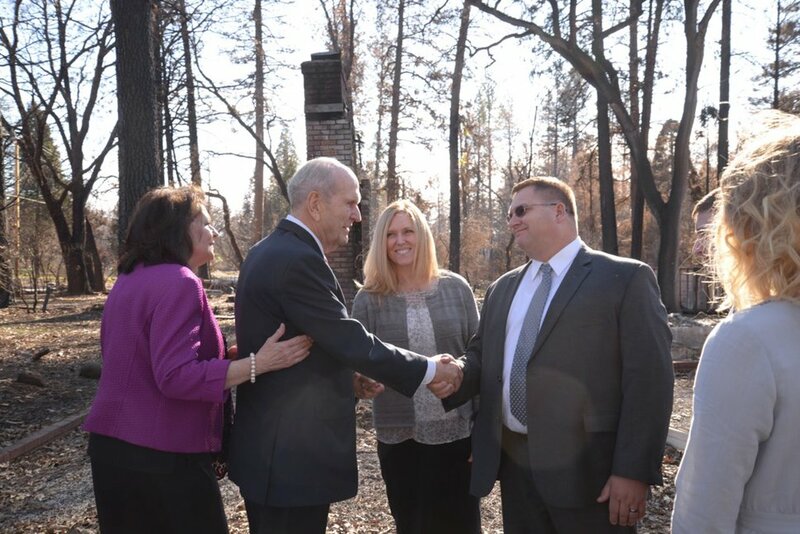 (Photo courtesy of The Church of Jesus Christ of Latter-day Saints) After his meeting in Chico, Calif., Jan. 13, 2019, President Russell M. Nelson met with Rob and Gretchen Harrison and their three children in front of what used to be their home. Spirituality, he said, offers solace secularism can’t match. Nelson emphasized that faith does not and cannot spare people from challenges, sorrow and physical and emotional pain. In his speech Sunday night, Nelson urged Arizonans to make their homes centers of learning and spirituality, according to a church news release, while advising them to “pray each day" to determine how best to do this. Dallin H. Oaks, Nelson’s first counselor in the faith’s governing First Presidency, pointed to the many changes enacted in the year since Nelson took the church’s helm, the release reported, and reminded members that improvements in their personal lives are even more vital. The church leaders’ visit to the Phoenix area was believed to be the single largest gathering of Latter-day Saints ever in Arizona, the release said. The Grand Canyon State is home to more than 428,000 members and five operating temples, including a sixth, in Mesa, undergoing renovation.